You may know by now about my obsession with shiny foreheads, so it's no wonder I was particularly interested in trying out Mary Kay's Shine Shutdown Bundle. - An Oil-Free Hydrating Gel to restore skin’s moisture balance and hydrate. This hydrating gel does a pretty good job with moisturizing your skin and controlling the shine. It also gets absorbed quickly. It does not leave a greasy film nor does it leave your skin feeling tight. As far as hydrating gels go, this is really good value for money.Keep in mind that there is no SPF protection in this product, so you will need to apply that separately. - An Oil Mattifier for shine control in the T-zone: you can use this mattifier to correct some particularly oily spots. Again, it does a good job keeping that shine in check and it's a great base under your make up. My skin feels smooth and balanced. 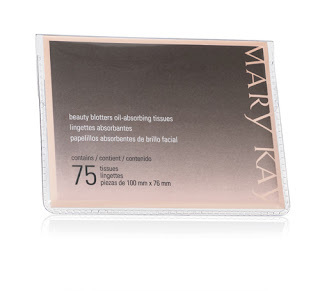 - Beauty Blotters® Oil-Absorbing Tissues to instantly absorb excess oil are great to use throughout the day. While the hydrating gel and the mattifier give you a good base to start the day, by the end of a busy day my skin feels oily again. These tissues absorb oil even when my skin doesn't look shiny. A must-have for your purse. All in all, I was pretty happy with this bundle. It doesn't look super fancy, but it does the job for a reasonable price. My skin feels smooth and balanced and that's all I need. Despite the fact, that Mary Kay's products are not available in stores, I've had great experiences with Mary Kay's beauty consultants. A good consultant will take the time to have you try their products. To find a Mary Kay's beauty consultant, check here.